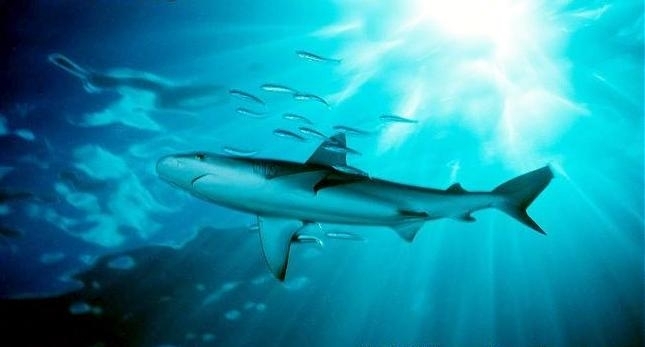 The Galápagos Shark is similar to the Grey Reef Shark but has a rounder head and a thicker body towards the tail section. 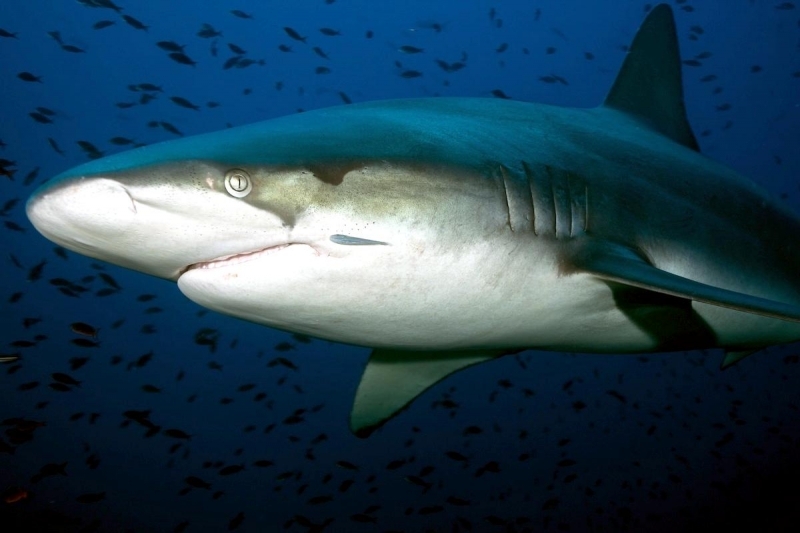 Galápagos Sharks are normally found in very isolated spots primarily concentrated in the Galápagos Islands and can grow to be nearly 12 feet in length. 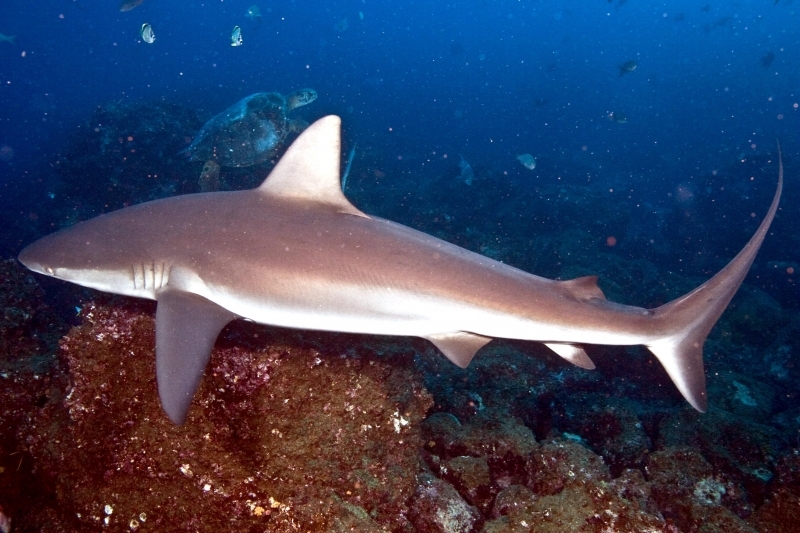 Galápagos Shark pups can be approximately 22 to 32 inches long and a litter can be anywhere from 6 to 16 pups. 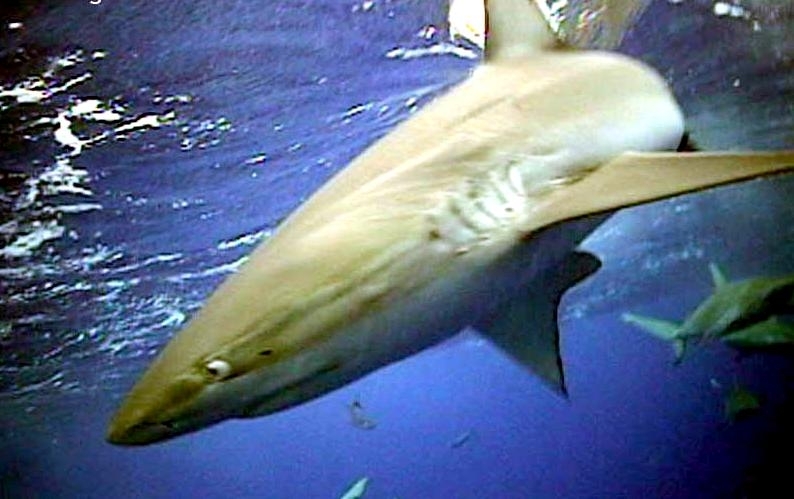 The Galápagos Shark is one of the larger species in its genus. 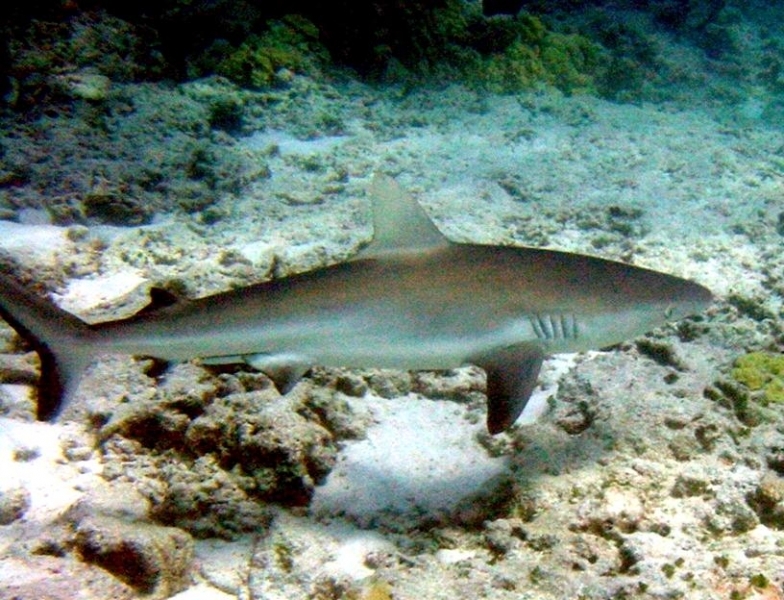 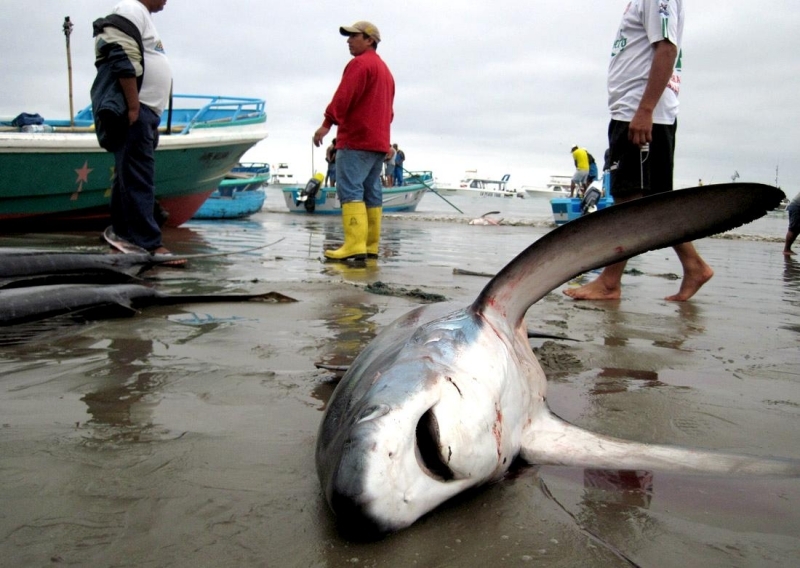 These sharks have a slender, streamlined body which is typical of the requiem sharks. 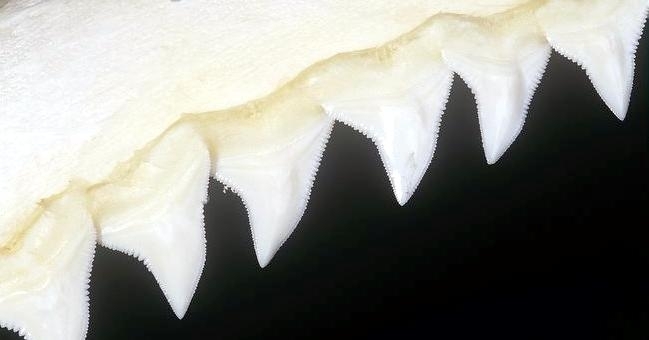 They have a wide and rounded snout with indistinct anterior nasal flaps. 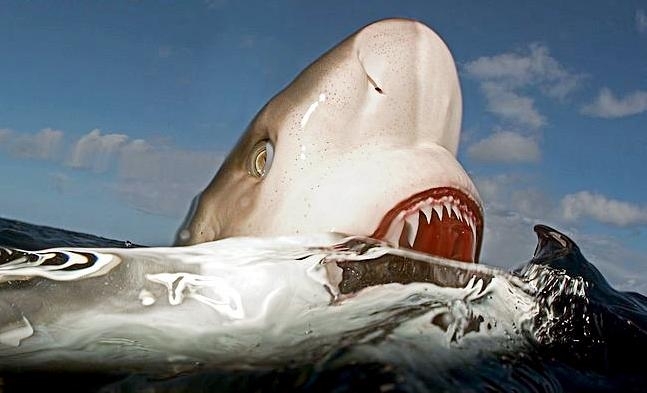 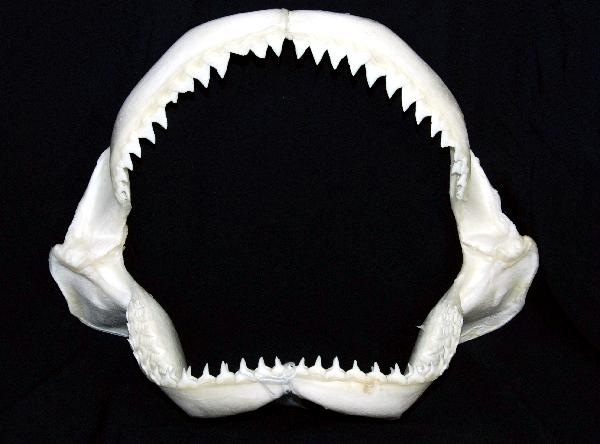 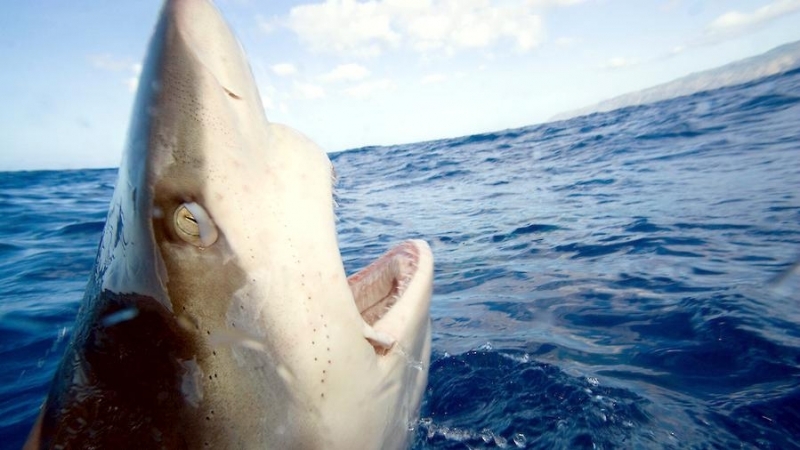 The eyes are round and of a medium size for a shark of that size and the mouth usually contains 14 tooth rows on either side of both jaws, plus 1 tooth at the symphysis (where the jaw halves meet). 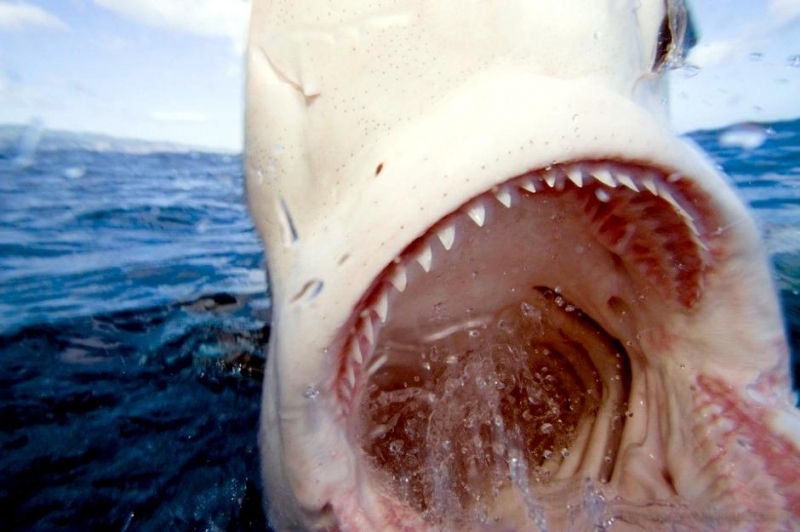 The upper teeth are stout & triangular, while the lower teeth are narrower. 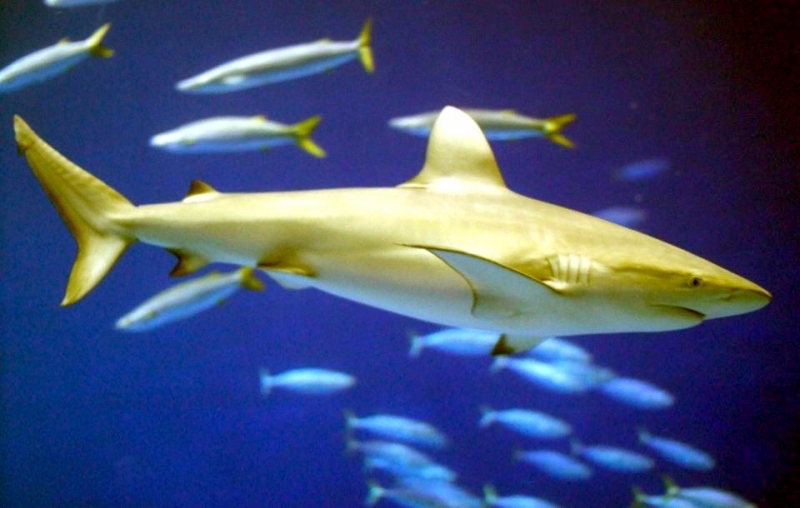 Galápagos Sharks primarily inhabit clear waters, coral reefs & rocky bottoms and often swim a few meters above the substrate. 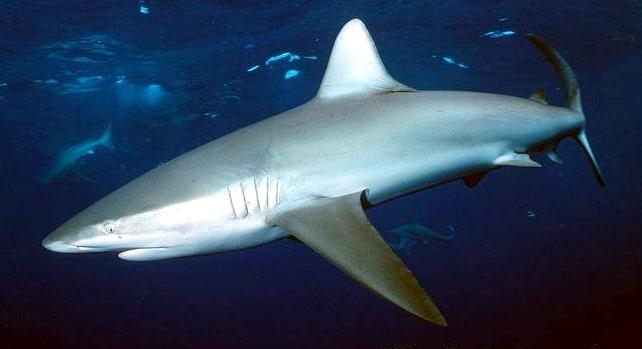 The Galápagos Shark is a common but habitat-limited species and is normally found at depths of 2 meters but ranges to the open ocean adjacent to islands, from the surface to at least 80 meters. 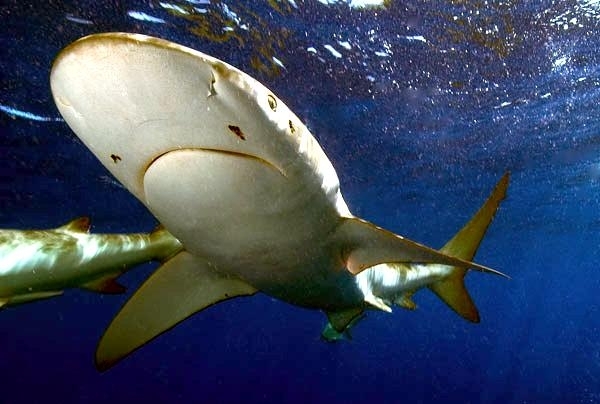 Juvenile Galápagos Sharks live in shallower waters in a depth of 25 meters or less, which are apparently use as nursery grounds to avoid being eaten by other sharks while the adults range offshore. 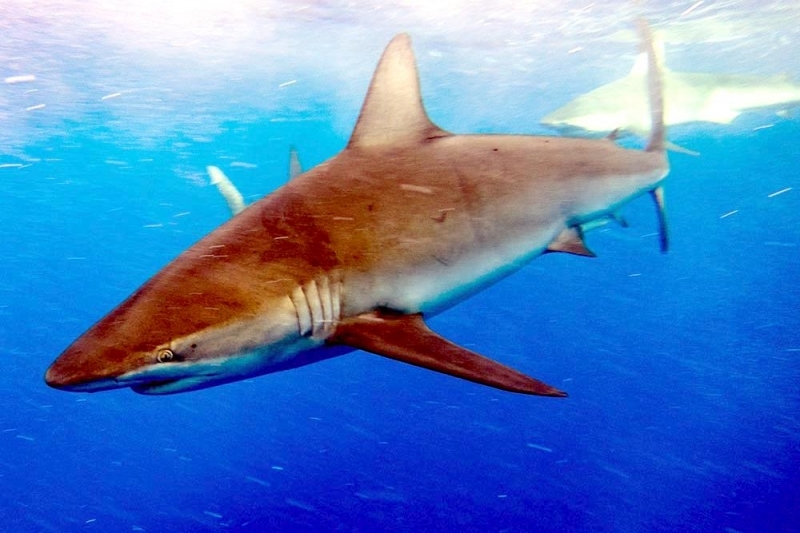 In the Galápagos Islands, Galápagos Sharks are abundant primarily on Darwin Island & Wolf Island, with an occasional balance around the archipelago. 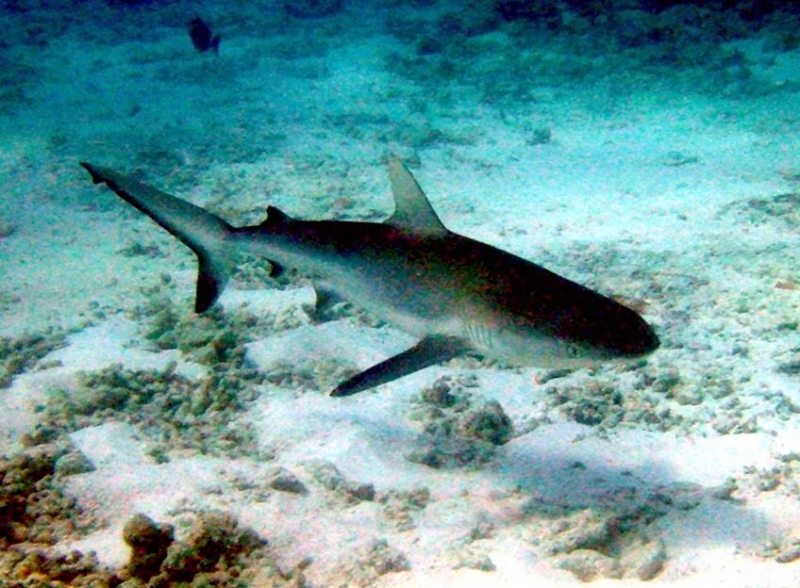 They can be spotted at certain snorkeling sites during a Galápagos Island cruise. 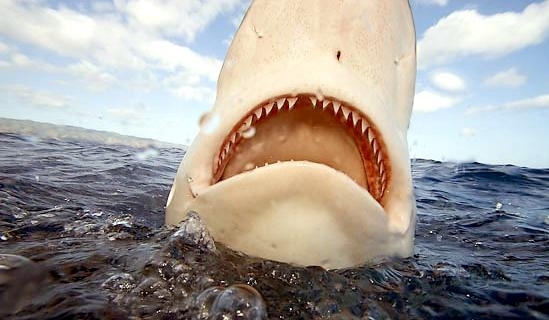 They live worldwide in tropical & subtropical waters. 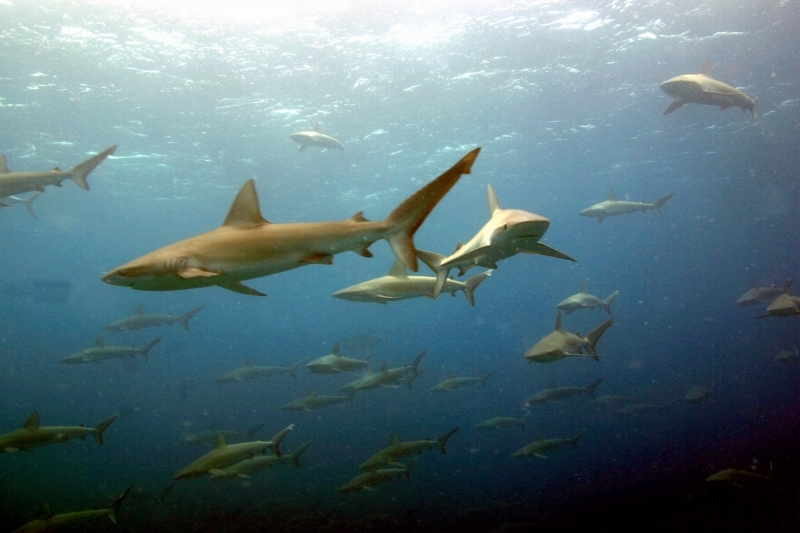 Galápagos Sharks usually cruise over rocky reefs, boulder strewn slopes and along walls. 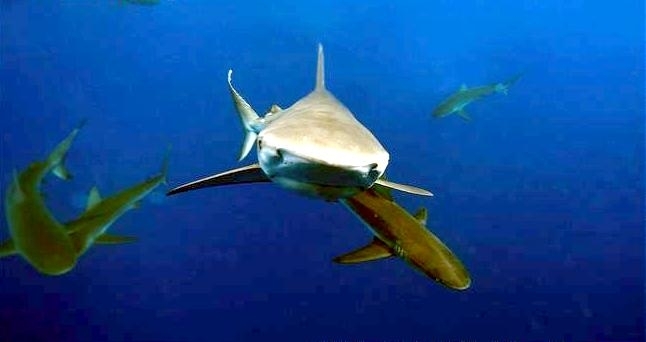 Galápagos Sharks are found in aggregations but apparently do not form coordinated schools like Great Hammerhead Sharks do in the Galápagos Islands. 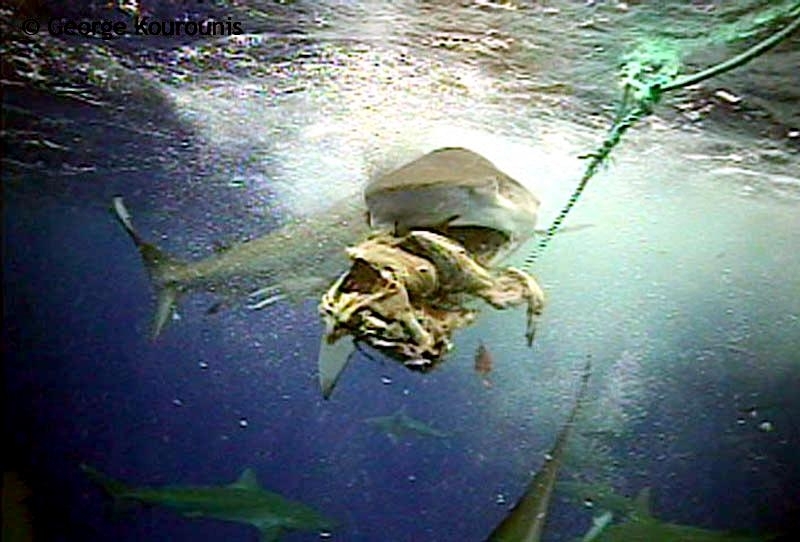 They feed primarily on bottom living fishes (eel, flatfish, triggerfish), but also feed on flying fish, squid and octopus. 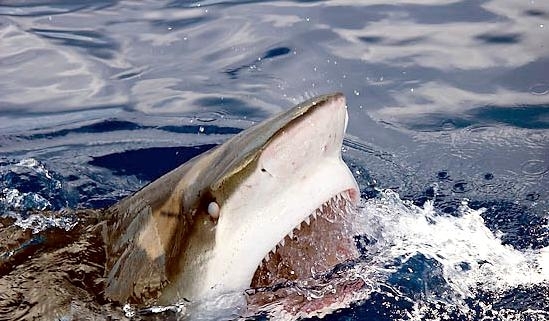 Sharks come in many different shapes & sizes, but people are most familiar with the classic look of a Galápagos Shark. 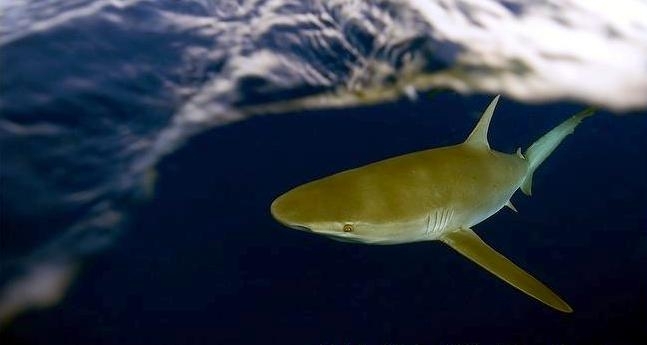 Its body is solid, large and torpedo shaped—an efficient form for swimming. 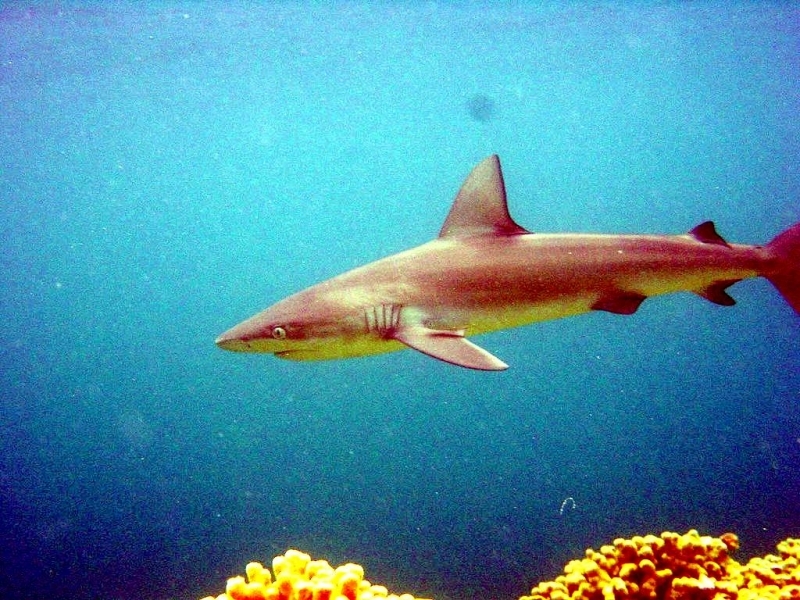 Dark gray above and lighter below, the Galápagos Shark has no distinctive markings except for a ridge that runs between its dorsal (back) fins. 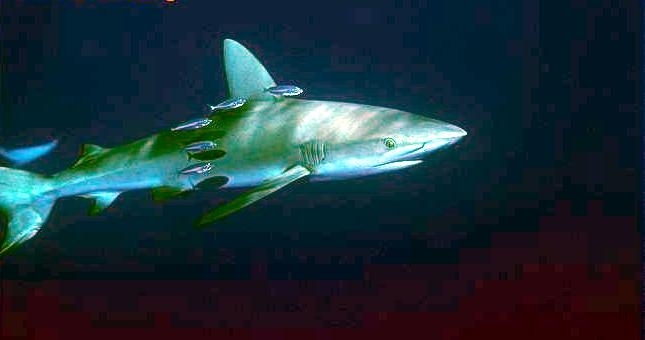 If threatened by a predator or competitor, the Galápagos Shark arches its back, lowers its pectoral (side) fins and swims in figure-eight loops. 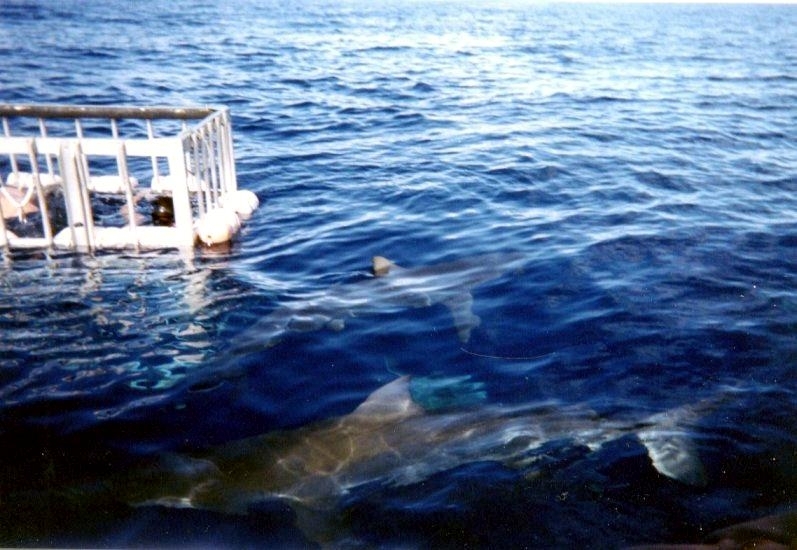 If the intruder doesn’t heed this display, the shark will chase & attack the intruder. 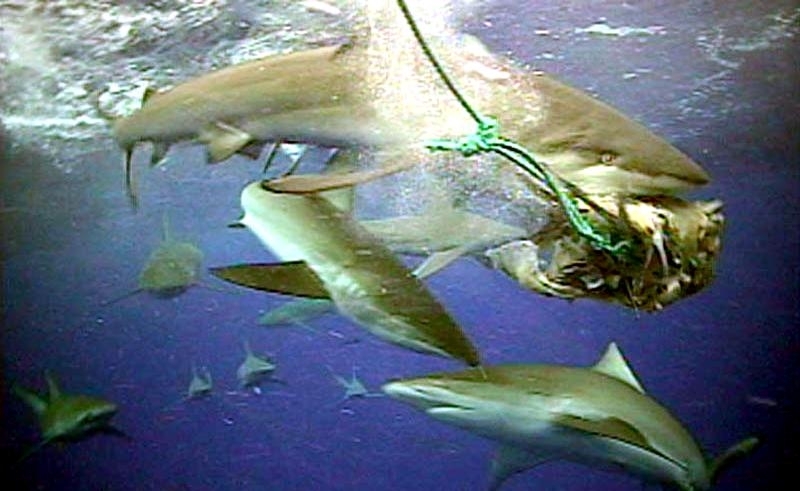 Although Galápagos Sharks are considered dangerous, they rarely attack humans. 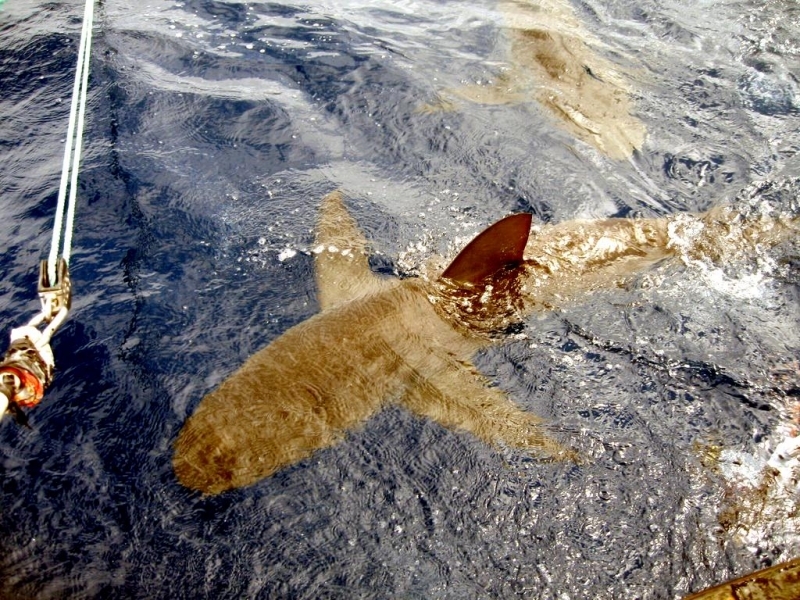 Like the other large sharks, they bear live young. 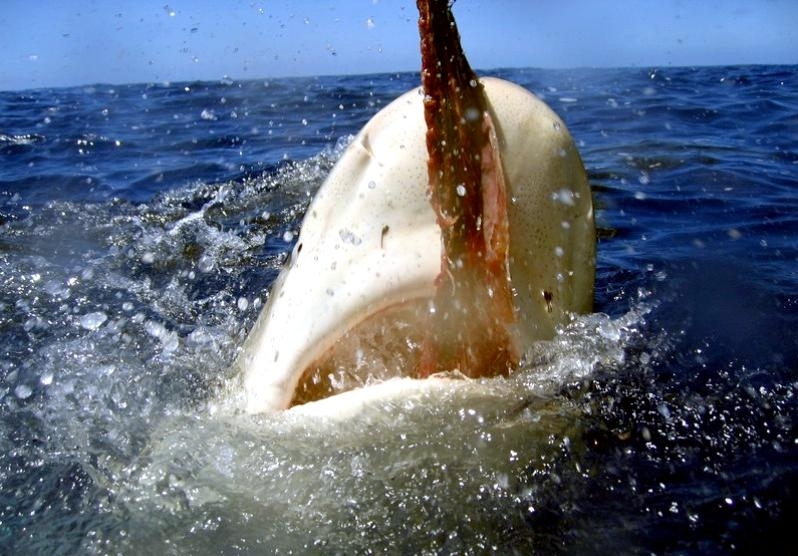 The embryos receive nourishment from a placenta-like attachment to the mother’s uterine wall. 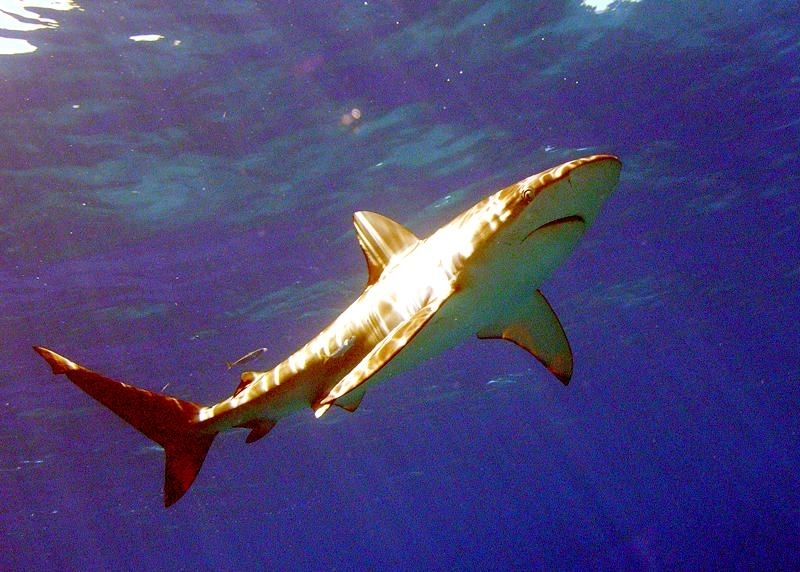 A Galápagos Shark is superbly sensitive to some odors. 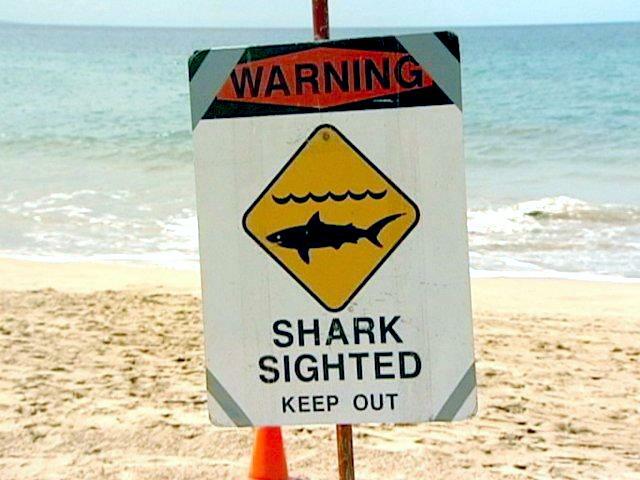 It can detect blood in a concentration of only one part per million—the same as one teaspoon of blood in an average-size swimming pool. 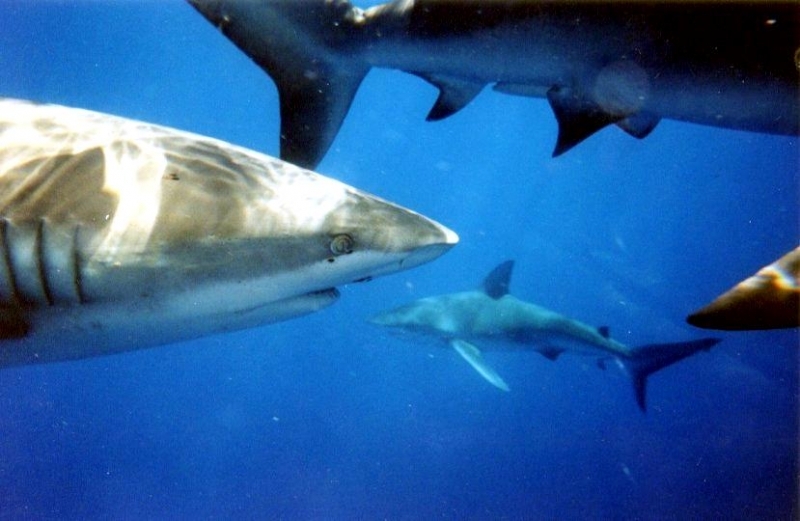 Galápagos Sharks are curious; they often gather around & bump into boats, oars, divers or anything else that seems to take their fancy. 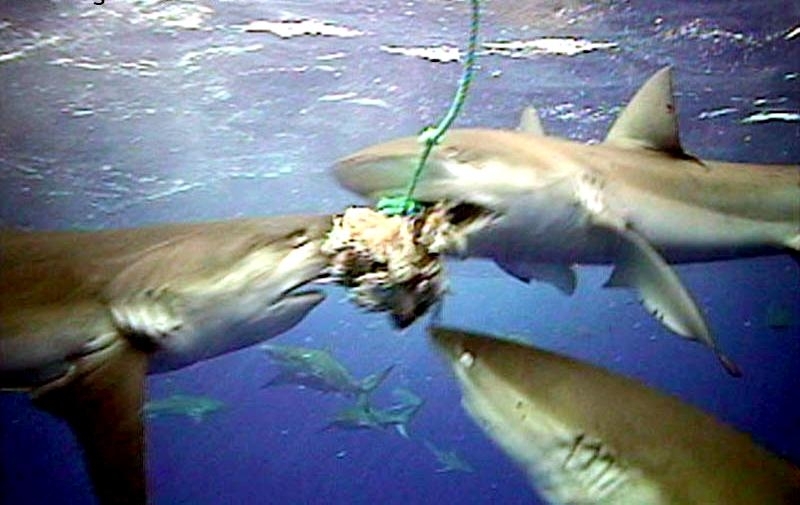 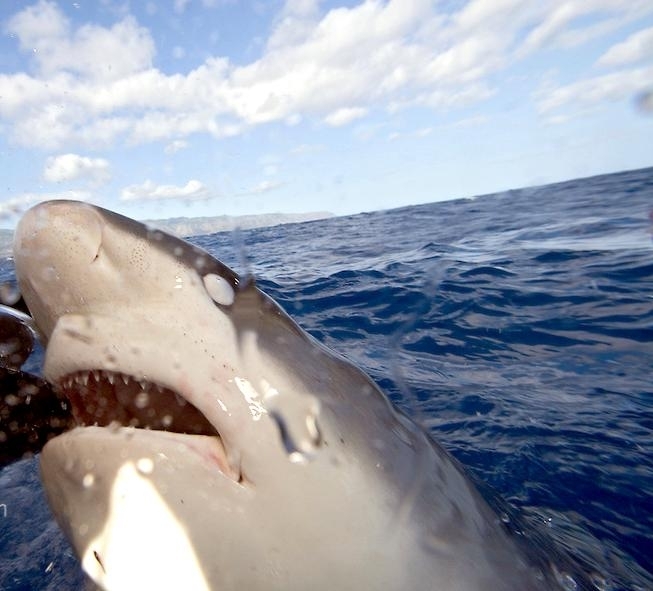 To rid its stomach of an indigestible object, a Galápagos Shark like several other shark species pushes its stomach out through its mouth, expels the object and then pulls its stomach back into its proper place.